As many of you are already thinking about getting a fish finder and some are in the middle of the reviews so that they can get an ideal one. We have thought to provide a write regarding a model from the Lowrance brand. As the brand needs no intro, you can somehow trust the quality and durability of their product that they deliver. So, with this Lowrance hook 3x dsi review, you will be able to know a lot about 3X DSI model that they are offering to the fishers. And as we have looked up to every corner of the device, we will put every detail of them in this Lowrance hook 3x dsi review. And we can assure you that this review will be a great help for you. To begin the Lowrance hook 3x dsi review with the highlighted feature, let’s get into more of this side. So, you can actually guess via seeing the title that the unit is a DownScan sonar unit, and it can work at two frequencies: 455 / 800 kHz. Moreover, the DSI skimmer coming with this unit supports both these frequencies.And to add more, you have the facility to switch between 455kHz and 800 kHz sonar frequency options quickly Besides, unlike the other models, this device uses fan-shaped beams for scanning, not conical as a transducer for DualBeam sonar. However, you can guess that the beam that the transducer uses for scanning in 455 kHz is kind of wider than the one for 800 kHz. So, it is best to put it on the 455 kHz mode if used on deeper water if you want better coverage. On the other hand, the 800 kHz mode offers superior clarity and is more effective on shallow waters. Moreover, as it is a DownScan unit, it does not come with extreme depth, yet it can keep the track up to 300 feet deep. But this design can track bottom up to 55mph. Moreover, you will find an LED backlight that helps to brighten up the display picture for you in any lighting condition. Besides, the device has a 3.5inch color display that offers a clear picture of the water in full sunlight and from wide viewing angles as well. So you can see that the display is pretty small, hence some of you might struggle while reading the details. However, the display is easy to read and it’s informative as well especially under the sunlight. Not only that, you can also use it during the night time. Furthermore, it comes with a 320 x 240, resolution letting you know everything under the waves. Lowrance hook 3x dsi features Skimmer transducer that comes with a sensor of water temperature so it can track the depth up to 55 mph. Moreover, it features Fish ID that shows the fish icons so it can notify you regarding the presence of fish. Not only that, you will also get other options including track and alarm options. Besides, the unit has another cool feature which is the ability to zoom so, with the quick keys it will let you zoom up to 4 times the standard view so you can focus the areas more properly. It features Downscan imaging which uses fan-shaped beams for scanning. You can quickly switch between 455 kHz and800 kHz sonar frequency options. It might not read if the water is under 3 feet. Poor packaging might destroy the product as some users found scratches on the screen. The display is way too small. Q: Will this connect directly to my boat battery? A: Yes, you can connect it to the battery or any 12 volt supply wire. Black wire to negative and Red wire to positive. A: No, but you need to purchase sealed 12 V lead battery and charger separately to work it out. A: No, the unit does not have GPS feature. Q: Does it have split screen capabilities? A: No. It is sonar so it does not have split screen capabilities. Q: Can the transducer mount to the trolling motor? A: It needs an adapter, but you can check out the Lowrance web site for DSI installation instructions. So, fishing becomes easier when you have an ideal fish finder with you and that ideal device can be Lowrance hook 3x dsi. Since it has all the features and functions with greater simplicity and basics, it gets all the remarks from the fishers. 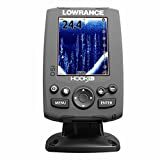 So we hope that you at least got to know more about the product from this Lowrance hook 3x dsi review. And not only hat we also hope that you can get to choose one for yourself soon.